The lawyers at Miller & Zois have handled countless premises liability or slip and fall injury cases all over Maryland. In a slip and fall case, the plaintiff asserts that they slipped and injured themselves as a result of some unsafe or hazardous condition (e.g. 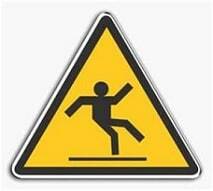 slippery or greasy floor with no warning) that the property owner negligently failed to address or correct. Injuries resulting from a slip and fall can range from minor to severe. A surprising number of slip and fall incidents actually result in death. Slip and fall accidents at nursing homes result in a large number of fatalities every year. What is a Slip and Fall Case Worth in Maryland? The national median award amount for industrial/commercial premises liability cases is $345,000. The median amount for all other premises liability claims nationwide is $105,000. The value of a slip and fall case will be driven by two separate factors: (1) the nature and severity of the injuries; and (2) the extent of the property owner's negligence and resulting liability. The impact of the first fact is fairly obvious. A slip and fall that results in minor injuries such as a sprained wrist or some bruising will naturally be worth much less than a case where someone slips and breaks a leg or worse. The second factor relating to the extent of the property owner's negligence is more complex and usually depends on the type of hazard or dangerous condition that caused the slip and fall: e.g., a wet floor with no warning; snow and ice; or dangerous design or construction. Even when a slip and fall results in serious injury, this second factor can often render the case worthless. In most cases, the plaintiff must show that the property owner had actual or constructive knowledge of the hazardous condition in order to establish liability. For example, if a customer walks into a store and slips on a banana peel they would need to prove that: (a) the store owner or employees actually knew about the banana peel or (b) that under the circumstances the store owner or employees reasonably should have known about the banana peel. If the plaintiff cannot prove notice the case could be worth nothing. Liability is much easier in cases where the hazardous condition was actually created by the property owner or its employees. The classic example of this is where an employee mops the storeroom floor. In this case, the plaintiff does not to prove actual or constructive knowledge of the wet floor. The property owner is the one who made the floor wet so knowledge is presumed. Reported verdicts and settlements in indicates that about 68% of Maryland slip and fall cases had a value somewhere between $5,000 and $50,000. Just under 5% of the cases had a final value in excess of $500,000. The highest reported verdict was $4.2 million which came in a 2002 case in Prince George's County where the Plaintiff slipped on ice, broke her leg and ended up with a bone infection. It would be great if there was a slip and fall settlement value calculator where we could just punch in some numbers. But there is no expected formula to predict the settlement value of a slip and fall case in Maryland. But a review of these cases shows that in Maryland there are at least 3 factors that will consistently impact the calculation of the value of a slip and fall case: (1) the severity of injury; (2) the nature and extent of the property owners' negligence and liability; and (3) the jurisdiction which the case is filed in. Below is a brief summary of each of these factors and a review of example cases. (2017) Wachuku v. Home Properties (Montgomery County). Plaintiff awarded $9,200 for minor injuries incurred when she tripped and fell in a stairway that was poorly lit by the property owner. (2012) Sharpe v. Shoppers' Food Warehouse (Baltimore County): Plaintiff received $11,400 for minor physical injuries due to a slip and fall on a wet floor with no warnings in the produce department of a grocery store. (2007) Perry v. Chick-fil-A (Howard County): Plaintiff awarded $20,000 for slip and fall on the icy parking lot while walking into a Chick-fil-A in Columbia. The injuries included a concussion but could still be classified as minor in nature. (2006) Strobel v. Department of Public Safety and Correctional Services (Anne Arundel County) Plaintiff got $9,000 for strained back and other minor injuries incurred when she slipped and fell on a cardboard box that was left in the middle of a hallway. When the plaintiff's injuries are more significant the value of these otherwise ordinary slip and fall cases can go up significantly. Below are examples of a few cases where a typical slip and fall resulted in more serious injury. (2007) Ferguson v. Frederick Westview Properties LLC (Frederick County): Plaintiff was awarded $153,000 in this case when she slipped and fell on a patch of ice at a shopping center in Frederick. The circumstances of her slip and fall were typical but she fell awkwardly and sustained permanent injury to her shoulder requiring shoulder-replacement surgery. (2004) Glidden v. Outback Steakhouse (P.G. County): Plaintiff claimed that she tripped over a waiter because the restaurant was poorly lit. Plaintiff's injuries from the fall were significant as she broke her wrist and also fractured her hip. She was awarded $160,000. In cases where the slip and fall is particularly violent or results in death or very serious and permanent injuries, the value of the case can skyrocket. (2007) Jaro v. Union Memorial Hosp. (Baltimore City): The plaintiff was a doctor who slipped on a wet hospital floor and the impact was particularly hard. The doctor suffered a stress fracture in one his vertebrae that required 3 separate surgeries. The injury was permanent and effectively ended his career. The case was settled for $1.5 million. (2002) Lockwood v. Centre Group L.P. (P.G. County): The Plaintiff slipped and fell on a patch of ice that the defendant failed to treat. As a result of the fall, plaintiff suffered compound fractures of both her fibula and tibia bones in her right leg. Complications arose during her recovery and the plaintiff developed osteomyelitis - a rare and very serious infection of the bone. The jury returned a verdict for the plaintiff in the amount of $4.2 million. Even when a slip and fall results in serious injury, this second factor can potentially render the case worthless. In most slip and fall lawsuits the plaintiff must show that the property owner had actual or constructive knowledge of the hazardous condition in order to establish liability. For example, if a customer walks into a store and slips on a banana peel the plaintiff would need to prove that: (a) the store owner or employees actually knew about the banana peel; or (b) that under the circumstances the store owner or employees reasonably should have known about the banana peel. If the plaintiff cannot prove notice the case could be worth nothing. A review of the reported verdicts and settlements indicates that the value of a slip and fall case can often depend on what Maryland county the case is filed in. Slip and fall cases in plaintiff-friendly jurisdictions such as Baltimore City and Prince George's County are consistently worth more than comparable cases in other counties. Take for example the 2012 case of White v. Shoppers Food Warehouse Corporation where the plaintiff got $35,000 for minor injuries after slipping on a wet floor in the produce section of grocery store. The facts and circumstances in White were virtually identically to another "produce section" slip case against Shoppers (Sharpe v. Shoppers Food Warehouse Corporation). The plaintiff in Sharpe arguably had more severe injuries but only $11,400. The only apparent explanation is that Sharpe was in Baltimore County. The damages in White were awarded by a P.G. County jury. Another example of this the 2016 case of Dunlin v. Two Farms Inc. In Dunlin neither of the first 2 factors were particularly strong - plaintiff's injuries were comparatively minor and the defendant claimed it placed adequate warning signs - but a jury in Baltimore City awarded $120,000 to the plaintiff. If you have a serious slip and fall injury case in Maryland, we can help you understand your options and the value of your claim. Pick up the phone and call us at 800-553-8082 or get a free Internet consultation.